For Surname Saturday I thought it was time to start investigating my surname. I originally thought it would be easy to research my TIMMINS name – but how wrong can you be? Firstly there are a large number of books and on-line articles speculating on the origin of the TIMMINS surname and the location it evolved from. Not surprisingly they don’t all agree! There are also the variant spellings of TIMMONS and TIMMS (and others). I think we will put this to one side for now, I can follow this up in a later blog. 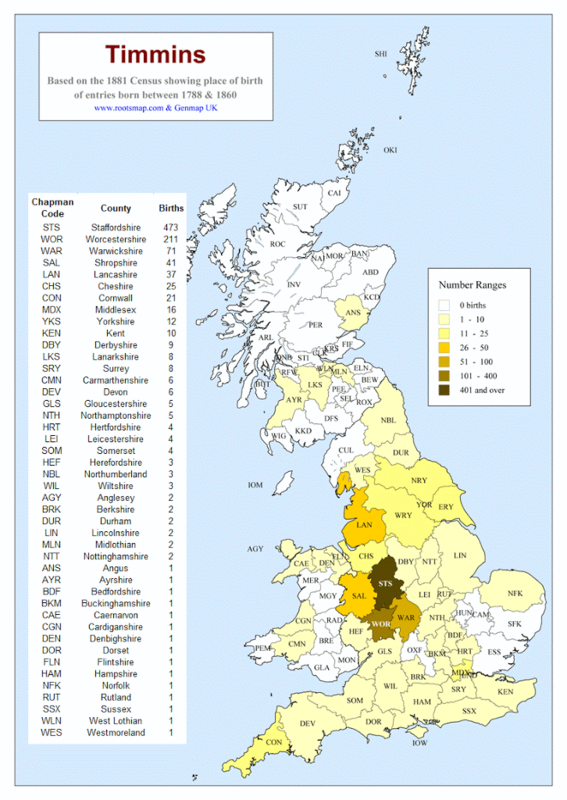 Let us try to look at some concrete information on where the surname may have come from, the 1881 census of England and Wales looks like a good place to start – or is it? Doing an exact name search on FindMyPast produced 2,335 matches. The same search on Ancestry gave 2,391 whilst on FamilySearch I got 2,337 matches. I chose the 1881 census as I presumed that all the transcriptions would be identical as the data used has been provided by the fabulous guys at the LDS. Ancestry actually gave a little more information as it also looks at the Scottish census – this added a further 62 Timmins’ to the mix (Ancestry total 2453). You would think that computer databases these days could come up with precisely the same answer to a simple query. Perhaps someone out there in blogger land can explain the differences. To find the origin of a surname you really have to understand where a person was born rather than where they lived when the census was taken. Another factor is that you need to look at the older people in the census as this this will give a view of what was happening to the population prior to the mass migration caused by the Industrial Revolution. This is now starting to look too complicated a search for the likes of the usual suspects i.e. FindMyPast, Ancestry and FamilySearch. So come to the rescue rootsmap.com . This is an on-line paid for service that provides a map and data matching the criteria I mentioned above. So here we have it, with the added bonus of Scotland. An advantage of the rootsmap.com web site is that it can also determine if there are any surname matches in Ireland; it uses the Griffith’s Valuation 1847 -1864 to achieve the results. Unfortunately my TIMMINS surname is not currently in their database. FamilySearch – for Timmins born in Ireland between 1788 and 1860 there are 1031 matches. Ancestry – for Timmins in the Griffiths Valuation gives 218 matches. Ask About Ireland – the raw data for Timmins in Griffiths Valuation gives 263 matches; this search also includes the Landlord which skews the result, also it does not take into account one person renting more than one piece of land. Irish Times – this gives a more precise figure of 121 matches, plus more valuable information on alternate names, also the households in each county and parish. The Irish Times site is by far the best resource for searching any potential Irish surname connection. Timins, Timmans, Tymanns, Ó Tiomáin (Wicklow), Mac Toimín (Mayo). Leaving Ireland behind for a while I need to look at the more dense population of Timmins in the West Midlands (Staffordshire and Worcestershire) to see if I can narrow down the parishes they frequented. So I run the software and get 2,414 matches, not quite as many matches as Ancestry? But here we have the Counties that I am interested in together with the data. Next I want to display the results by Parish, it can’t achieve this but it can provide the Poor Law Union breakdown. The density of Timmins’ in the Dudley Poor Law Union would appear to indicate that the surname could have established itself here at an early stage. More investigation into this will follow in further blogs. Just as I thought that I had finished another thought popped into my head “Google British Surnames”. Yet more information……………… rather than copy and paste it here I will let you click on the links and explore my surname further at these web sites. In fact why not explore your own! 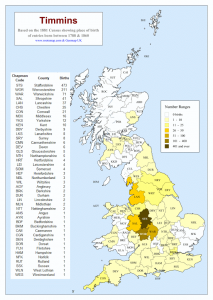 gbnames – the Great Britain Family Names Profiling website which presents the findings of a project based at University College London (UCL) that is investigating the distribution of surnames in Great Britain, both current and historic. britishsurnames – The British Surnames website. Here, you can find information on similar surnames, most common surnames, surname meanings and etymologies as well as discussing your name in the forum. As the name suggests, this site primarily lists surnames commonly found in Britain, but many of these are found in other parts of the world as well – so even if you’re not British, your name could well be in here! americansurnames – See how the name has spread. Timmins is a city in Northern Ontario with a population of nearly 43,000 (2006 census). The City stretches over approximately 2,961.52 km2 (1,840.20 sq mi) of land, making Timmins one of the largest cities in Canada land wise. Timmins was founded January 1, 1912 and is named after Noah Timmins, founder of the Hollinger Gold Mine. The gold rush of 1909 earned Timmins the nickname of the “City with the Heart of Gold”. The city is located in one of the richest mineral producing areas in the Western Hemisphere. It is a leader in the production of gold and base metals. Main attractions are mining tours, outdoor recreation and the Shania Twain Centre. Click on the images above to see them in more detail. Thanks for taking the time to read this, I hope you found it interesting. Please leave comments below, or you can email me direct. This entry was posted in Timmins by Tony. Bookmark the permalink.